Improve your productivity and keep employees on site with vending machines or office coffee services from Hagerstown Canteen Service in Chambersburg. 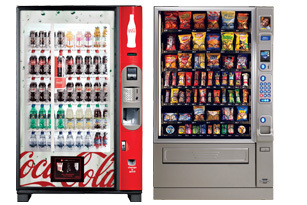 We have Pepsi and Coke machines, food vending machines, snack vending machines, candy vending machines, coffee vending machines, healthy vending machines, and vending machines with sport drinks, juices, milk and energy drinks. Vending machines are not the only way to provide food and drinks, and we can show you other options available such as a Micro Market for your Chambersburg business. Your Chambersburg employees deserve a premium cup of coffee. You can give them coffee house quality product right in your office break room. Your break room will be fully stocked and organized so you'll never need to head out for that stimulating cup of coffee. Your employees will stay in house and relax during their break time instead of rushing out. We can also improve the quality and quantity of your drinking water with bottleless water filtration systems from Hagerstown Canteen Service. Contact us today at (301) 223-8000 or email info@hagerstowncanteen.com.